This chapter describes construction and use of data sets. perClass stores data in sddata objects. sddata behaves as a data matrix augmented with additional meta-data such as class labels or feature names. The figure below provides a schematic illustration of sddata object structure. The data is stored in a matrix with rows corresponding to samples and columns to features. Each data sample is thus represented by equal number of features. A data sample belongs to a class. The class label is accessible via the field called lab. The features names are stored in the field featname. 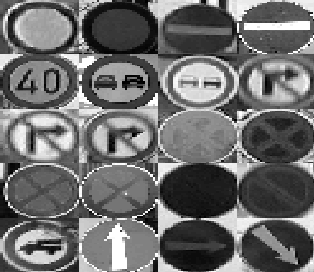 The data matrix contains images of road sign boards, rescaled to 32x32 pixel raster and reshaped into 1x1024 vectors. For each sign, we also have its type as string. sddata object may be constructed by providing a matrix of numbers in double precision. The object a is created which represents our data set. If we omit the semicolon, Matlab displays size of the sddata object and some additional information. Note that all samples are labeled into the class 'unknown'. sddata set always contains at least one class. If no class labels are provided, as in our example, the default unknown class is assigned to all data samples. We can see that our data set now contains 17 classes. The standard display shows the per-class number of samples. Data sets may be imported from comma-separated text file using the sdimport command. Samples are assumed to be stored in rows and features in columns. By default, sdimport assumes that the file contains only data matrix. Here we load 10 samples each with 3 features. The delimiter character may be changes using 'delimiter' option. The first column specifies the day of data acquisition. We may use it as an additional label to understand differences between class distributions at different days. Data sets may be exported to a comma-separated file using the sdexport command. Currently, sdexport outputs only data matrix and labels. Note that the file contains a header listing the content (data matrix with 2 features and labels). Second line contains the sdimport command that may be used for quick reading of this text file into perClass. sddata behaves as a matrix with rows representing data samples and columns representing features. Note that the resulting data set b contains only four classes. Empty classes are automatically removed. For small numbers of classes, sddata display provides also the class names and sample counts. Note, that the length operator always returns number of samples (and not, the largest dimension as is Matlab convention for matrices). Displaying the list allows us to see the order of classes. perClass introduces the concept of properties. Property is any user-accessible part of the sddata object. sddata uses the structure metaphor and exposes its data properties as fields. For example, the raw data content of the sddata object a is accessible using a.data and sample labels using a.lab. There are three types of properties, referring to samples, features and to the entire data set. 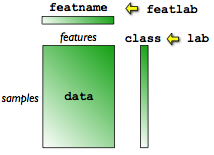 For example, class label is a property of a data sample and feature name of a data set feature (column). Data properties refer to the complete data set. We may, for example, add a timestamp property defining acquisition time. All sddata objects share some default properties such as data (data matrix), lab (sample class labels) or featlab (feature labels or names). These properties cannot be removed. User may add any number of custom properties describing problem specific meta-data. For example, when working with medical data, we may wish to attach patient id to each data sample. This allows us to visualize class distribution in each patient. In the schema below few properties are added to the data, beside the primary label cancer\healthy. It is the patient id, the tissue type and the hospital that generated the data set. Multiple labels is a powerful tool that allows a better understanding of the problem at hand. The labels may be inspected with the interactive visualization tools, but also used for a robust classifier evaluation. See the example of cross-validation over properties. We can see separately the sample, feature and data properties. Note the special 'lab' and 'featlab' properties that act as a proxy pointing to the current sample labels (by default 'class') and feature labels (by default 'featname'), respectively. Details about switching between multiple labels is described in the next section. We may retrieve property of any type using getprop or field access. To set a property we may use the field assignment. For example, we may create a new sample label defining on which day was a road sign image (sample) acquired. Property may be also any matrix or cell array. The only requirement is that its first dimension is equal to the number of samples. We may, for example, create a sample property 'id' holding a unique number for each sample. The 'id' property may help us to identify a specific sample in a data subset. Given an additional 'feat' argument, setprop sets a feature property. Setting a feature property may be useful when subsets of out features are computed with different feature extractor software (or version) and we wish to preserve knowledge of this grouping. Multiple feature labels are also present when computing similarity-based data representation. Feature property may be any sdlab object, matrix, character array or cell array with the first dimension equal to the number of features. Data properties are set using setprop with additional 'data' argument. There is no constrain on type or format of data properties. As the second output argument, isprop returns the property type ('sample','feat' or 'data'). For non existent properties, empty matrix  is returned. Properties may be removed using rmprop method. The properties used for 'lab' and 'featlab' proxies and 'data' property cannot be removed. Many pattern recognition problems benefit from using more than one set of labels. For example, in road sign recognition we may investigate separately class distribution inside urban areas or along the highways. sddata object makes it easy to work with multiple sets of labels. Any indexed property (an instance of sdlab class) may be used as a label set. TIP: When writing your custom algorithms, access labels through the lab proxy. In this way, the function will be directly applicable to any user-defined set of labels. The substring B24 matches two class names, B24a and B24b. The find query can also be used with regular expressions. The example below shows how to retrieve the indices of the classes that contais B24 or C5. Note that some classes may disappear not being selected. It is often useful to define new classification problems by renaming the existing classes. For example, in the road sign problem, we might be interested building classifiers for the high-level groups of prohibitive signs (with red/white/black boards), red/blue no-stopping/parking signs and blue/white obligatory signs. First, we labeled classes matching B28 OR B29 into nostop, then all the classes containing B will became prohibitive and, finally, the ones containing C were labeled obligatory. sdrelab allows us to add a prefix or suffix string to all class names with one command. This is useful, for example, when comparing two versions of the same data set when analyzing effects of updated feature computation or sensor normalization. We may add the prefix 'old' to the classes in old data set, concatenate the old and new data sets and visualize the total set using sdscatter. This will allow us to visually separate old and new object instances. The option 'add' is a synonym for 'prefix'. sdrelab also provides the 'suffix' option.